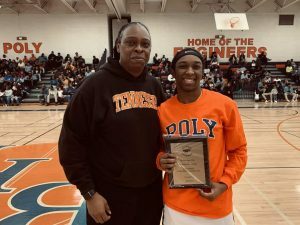 Dunbar Athletic Director and Baltimore City girls basketball representative Dana Johnson (left) poses with Poly’s Brashae Rice. 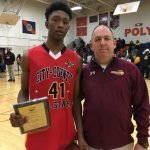 Rice was the City’s MVP as Baltimore City defeated Baltimore County in the annual senior all-star game at Poly Friday. 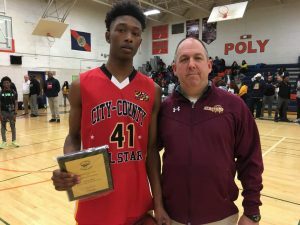 After an outstanding showing at the state public boys basketball Final Four last weekend, Baltimore City bested its county rivals Friday evening in the annual senior all-star showcase at Poly. The City rallied in the second half for an 111-107 decision, capping a sweep for the Charm City. The City girls posted a 72-52 victory over the County in the opening match. City College’s Jazmine Davis finished with a game-high 17 points. 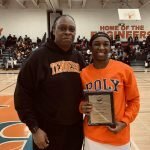 Brashae Rice from Poly was named Most Valuable Player for the City squad. 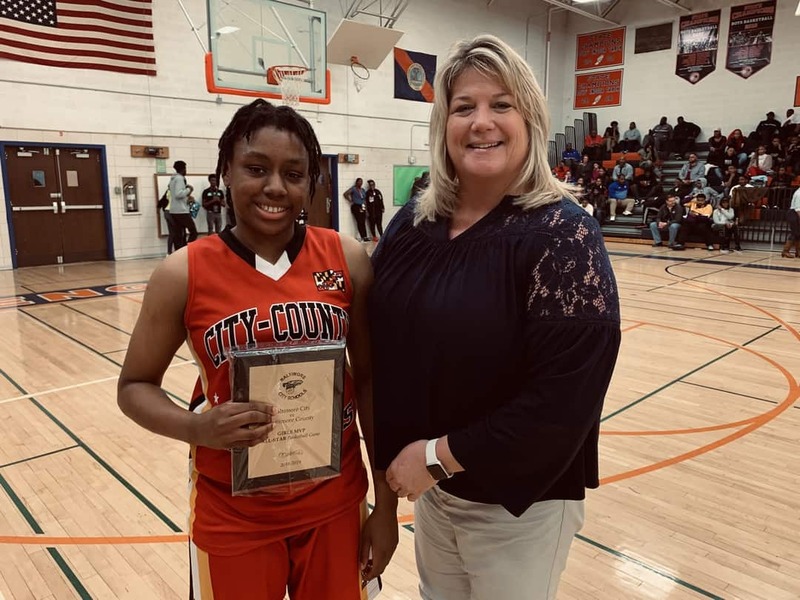 Trinity Horton from Chesapeake-Baltimore County led the County with 10 points, earning team MVP honors. Patterson’s Jalen Willis was MVP for the City boys. 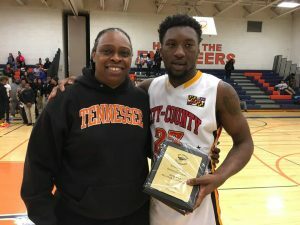 Willis had 18 points, all in the second half, in the City’s 111-107 victory over the County All-Stars. Trailing 57-50 at halftime, the City exploded in the third quarter before holding on in the boys match. 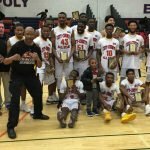 Jalen Willis from Class 2A and Baltimore City champ Patterson posted 18 points, and teammate Tyrone “TJ” Thomas added 17. 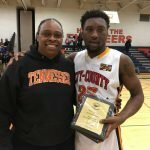 Willis, a 5-foot-11 guard, was named MVP for the City squad. Chris Barnett (National Academy Foundation) and David Harris from 1A state champ Lake Clifton, finished 16 and 11 points, respectively. Douglass’ Randy Turner added 14. Dundalk’s Jaylon Johnson led the County with 16 points, and Mark Suchy (Hereford) and Milford Mill Academy’s Derrick Shoats each had 13 points. Shoats, a 6-foot-4 forward, was selected MVP for the County squad. Shoats’ Milford teammate, Darius Woods, added 10 points. 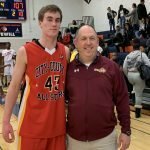 Milford Mill’s Derrick Shoats (left), pictured with Hereford basketball coach and Baltimore County boys basketball representative Jim Rhoads was MVP for the Baltimore County boys All-Stars Friday. 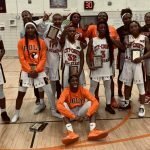 County – Ayana Booze (Franklin) 6, Brynne Deluzio (Hereford) 5, Destiny Perry (Sparrows Point) 7, Allyah Tucker (Randallstown) 9, Inaya Billy (Sparrows Point) 2, Trinity Horton (Chesapeake-Baltimore County) 10, Mikayla Kemp (Loch Raven) 7, Taylah Saunders (Pikesville) 4, Aysia Ferguson (Catonsville) 2. Totals 18 9-18 52. 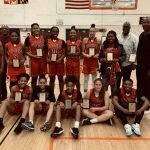 City – Janya Lilly (Poly) 9, Ty’Yanna Holly (Dunbar) 4, Kearra Earl (Dunbar) 8, Tkkeara Burden (Western) 6, Brashae Rice (Poly) 6, Destiny Hawkins (Western) 7, Jazmine Davis (City College) 17, Nathanielle Taylor (Dunbar) 7, Gianni Jones (Poly) 7, Kamryn Carter (Mervo) 5. Totals 26 14-26 72. 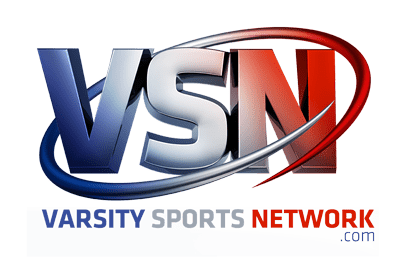 County – DJ Cloude (Perry Hall) 7, Michael Johnson (Dundalk) 12, Jaylon Johnson (Dundalk) 16, Charles Gibson (Loch Raven) 7, Destin Gallop (Overlea) 2, AJ Sims (Franklin) 5, Cameron Carter (Chesapeake-Baltimore County) 3, Rodney Gross (Overlea) 2, Maurice Smith (New Town) 6, Dawaun Gwynn (Randallstown) 3, Derrick Shoats (Milford Mill Academy) 13, Jordan Guerrero (New Town) 6, Mark Suchy (Hereford) 13, Damien Coleman (Chesapeake-Baltimore County) 3, Darius Woods (Milford Mill Academy) 10. Totals 45 10-23 107. 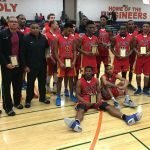 City – Malik McCormick (Dunbar) 2, Tyrone Thomas (Patterson) 17, David Harris (Lake Clifton) 11, Randy Turner (Douglass) 14, Carson Smith (Digital Harbor) 3, Dakota Diaz (Benjamin Franklin) 1, Gerrard Mungo (Patterson) 4, Jalen Willis (Patterson) 18, Keith Bolden (Edmondson) 2, Marvin Price (Patterson) 4, Ramone Johnson (New Era Academy) 2, Markus Hocker (Edmondson) 5, Chris Barrett (National Academy Foundation) 16, Deon Durant (Douglass) 8. Totals 46 12-23 111.